Vision is a human's most important sense - about a third of the cerebral cortex is predominantly devoted to visual processing (Van Essen and Drury, 1997; Van Essen, 2004). Vision starts in the retina, where a mosaic of specialized neurons, the photoreceptor cells, captures light and converts it into internal signals, forming the basis of human visual perception. Two retinal diseases that involve a progressive loss of photoreceptors and concomitant visual impairments are most prominent: age-related macular degeneration and retinitis pigmentosa (Weiland et al., 2011). Despite their incidence, many mechanisms in those diseases and the death of cells and its progression are not well understood. One reason for this disparity lies in limitations inherent to current imaging and function testing technologies that are available to the clinical practice. This gap may be closed with the use of a recent technology, adaptive optics scanning laser ophthalmoscopy (AO-SLO), which enables investigation of human visual perception on a single cell level in vivo, ultimately helping to understand the role of individual cones in visual processing and their fate during disease. The first scanning laser ophthalmoscope (SLO) was built by Webb, Hughes and Pomerantzeff in 1980 and regarding to its mode of operation it was termed “flying TV spot ophthalmoscope” (Webb et al., 1980). A cathode ray tube and the SLO have in common that the single frame is generated continuously pixel by pixel and line by line during boustrophedon scanning of a light beam. Due to the continuous movement of the light there is no optical image of the retina at any single moment, like in fundus photography. Instead, a retinal image is assembled based on the temporal video signals of a photomultiplier tube that is located in a retinal conjugate plane. One of the advantages of this technology is high light efficiency compared to conventional imaging systems (Webb and Hughes, 1981), which also provides more comfort and safety for patients and subjects. One of the major improvements in retinal imaging came with the development of adaptive optics (AO) for ophthalmoscopy (Liang et al., 1997). Because the eye's optics are generally imperfect, lateral resolution of ophthalmoscopy was limited to the degree that those ocular aberrations impose. Using adaptive optics, a correction of higher-order aberrations of the human eye and therefore high resolution retinal imagery of microscopic structures such as single photoreceptor cells became possible (Roorda, 2011). The AO-SLO is an excellent tool for visual psychophysics, because the locus of stimulation can be viewed directly in the retinal image. Functional testing of individual cones is possible by modulating the imaging beam, or a dedicated stimulation beam, to form visual stimuli directly on the subject's retina. This is achieved by high-speed acousto-optic modulation, which turns light on and off fast enough to allow only a fraction of a targeted photoreceptor cell to receive light (Fig. 1). The current hardware implementation allows ~10-bit modulation depth for stimuli, opening a host of stimulus definitions to be rendered for testing. Combined with retinal motion tracking, the AO-SLO makes psychophysical testing of single cone photoreceptors and studying their contribution to visual perception possible (Harmening et al., 2014). 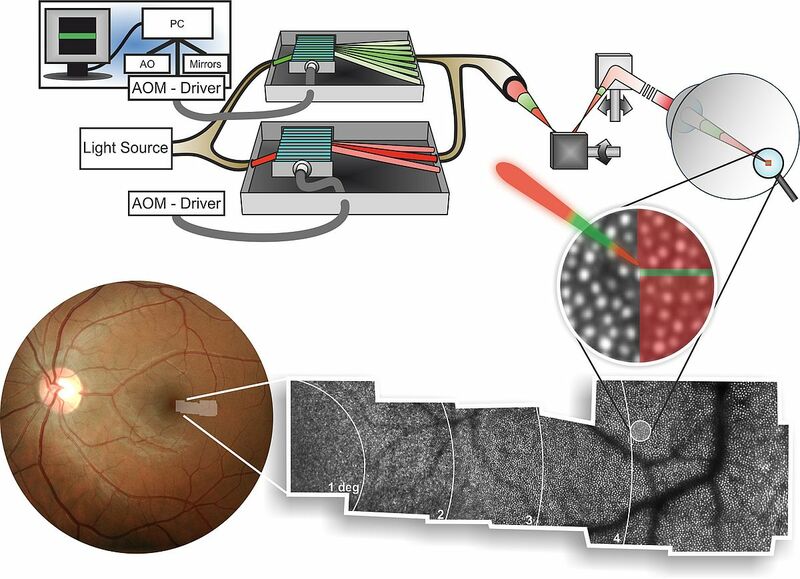 Figure 1: Schematic and simplified light path of the AO-SLO for in vivo retinal imaging and single cell psychophysics. Upper Panel: Light is provided by a super continuum laser and intensity is modulated by fast acousto-optic modulators (AOM, 250 Mhz bandwidth). Modulation is achieved by refracting incoming light. The combination of a slow scanning mirror (30 Hz) and a fast scanning mirror (16 kHz) produces a two dimensional scan field on the retina, which constitutes the AO-SLO micro-display. Lower Panel: View on a subject‘s retina with a fundus camera and an AO-SLO. Because each photoreceptor acts as an optical wave-guide, it absorbs and reflects light within a narrow acceptance angle, allowing them to be imaged as brightly reflective spots. Simultaneous stimulation during imaging of single cones using the AO-SLO is illustrated by green coloring of the scanning beam. Dark branched areas are shadows of blood vessels. 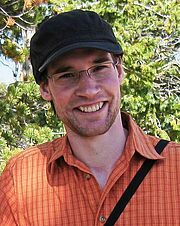 I am a PhD student in the newly established Adaptive Optics lab at the Department of Ophthalmology of the Rheinische Friedrich-Wilhelms-Universität Bonn (led by Dr. Wolf Harmening) since April 2014. We are currently building a hybrid AO-SLO system to be deployed at the University Eye Hospital in Bonn. Until now, AO-SLO based psychophysical experiments had to be done in the parafovea because of limitations in system resolution and stimulus size. With improvements in optical design and better wavefront correction with new deformable mirror hardware we hope to achieve in vivo imaging and testing of rods and foveal cones (Dubra et al., 2011). The first aim of my thesis encompasses the evaluation and optimization of the AO-SLO display characteristics. Taking advantage of these optimizations, we will hopefully be able to generate stimuli small enough to move the single cone experiment from the parafovea into the fovea. Psychophysical testing of foveal detection units is the second aim of my research project (Fig. 2). This enables, for instance, to directly test the long-standing hypothesis of foveal “private lines” for the first time in an in vivo experiment. Figure 2: Proposed detector-units of the parafovea (A) and the fovea (B). Proposed mapping of the cone's network to reveal the retinal circuitry of the parafovea and fovea with the center and surrounding cones of a ganglion cell. One approach to detect if two cones feed into the same ganglion cell is to test for threshold light intensity leading to perception when two cones are stimulated individually and concurrently. If both cones feed into the same detector circuitry the threshold light intensity is half of the light needed to drive the cones individually and follows linear summation principles. Dubra A, Sulai Y, Norris JL, Cooper RF, Dubis AM, Williams DR, Carroll J (2011) Noninvasive imaging of the human rod photoreceptor mosaic using a confocal adaptive optics scanning ophthalmoscope. Biomedical Optics Express 2:1864-1876. Harmening WM, Tuten WS, Roorda A, Sincich LC (2014) Mapping the perceptual grain of the human retina. The Journal of Neuroscience 34:5667-5677. 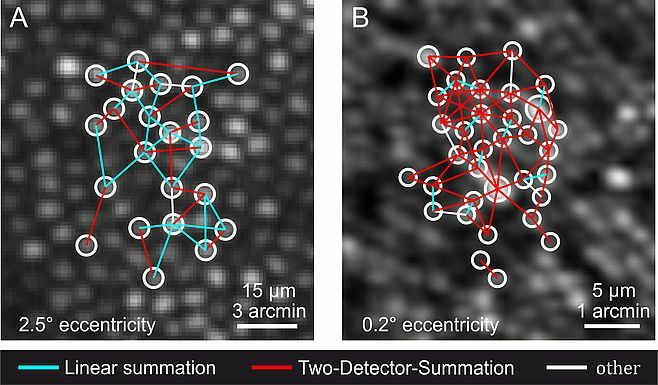 Liang J, Williams DR, Miller DT (1997) Supernormal vision and high-resolution retinal imaging through adaptive optics. Journal of the Optical Society of America. A, Optics, image science, and vision 14:2884-2892. Roorda A (2011) Adaptive optics for studying visual function: A comprehensive review. Journal of Vision 11:1-21. Van Essen DC, Drury HA (1997) Structural and functional analyses of human cerebral cortex using a surface-based atlas. The Journal of Neuroscience 17:7079-7102. Webb RH, Hughes GW (1981) Scanning laser ophthalmoscope. IEEE transactions on Bio-Medical Engineering 28:488-492. Webb RH, Hughes GW, Pomerantzeff O (1980) Flying spot TV ophthalmoscope. Applied Optics 19:2991-2997.